For the second year in a row, we are delighted to bring you ArtPrize On-Stage, the programming that brings live performances to the ArtPrize night scene—including music, theater, and comedy acts. ArtPrize celebrates artists working in all mediums, and music is no exception. This year you’ll be able to enjoy live music every day on the Blue Bridge with the Blue Bridge Sessions, 30-minute busking performances throughout the 19-day event, as well as the Blue Bridge Music Festival. This two-day festival promises to bring epic musical entertainment featuring ArtPrize musicians performing alongside well-known Michigan bands on Friday, September 30 and Saturday, October 1. In addition to being eligible for $500,000 in ArtPrize Awards in the Time-Based category, ArtPrize Eight musicians will be eligible to win $10,000 in independently organized awards. These Blue Bridge Songwriters Awards will include ten $1,000 cash prizes—five decided by public vote and five by expert jury. A song competition for original music has been a longstanding tradition with ArtPrize, and we've teamed up with AMI Entertainment to have JukeBoxes placed throughout Grand Rapids, so you can enjoy music while you cast your votes. 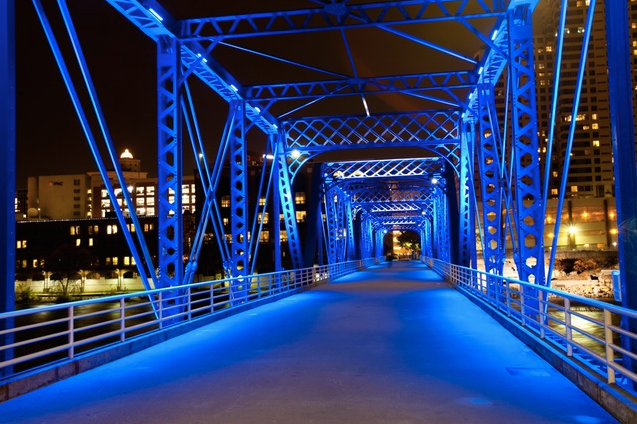 The Blue Bridge Sessions and Music Festival are sponsored by AMI Jukeboxes, with support from Downtown Grand Rapids, Inc. and Experience Grand Rapids.